Earlier this year, Stonewall Darts disappeared from the LGBT sports community in the District. It was part of the D.C.-based Stonewall Sports organization that offers kickball, bocce, dodgeball, billiards, climbing and yoga. The rumors were formed quickly that the league had been kicked out of the group or that there were personality conflicts. Even the new name, Rogue Darts, could be perceived as a diss. Henderson was among the first players in the inaugural Stonewall Kickball league in 2010 and the first Stonewall Bocce league in 2011. He was working as a bartender at MOVA when the idea came to launch Stonewall Darts in the bar’s back room. The first season in 2013 drew 72 players. There was immediate success with growth resulting in a move to Diego and eventually to Cobalt in 2015. Demand was so high that members formed an offseason league at Nellie’s called Tuesday Night Flights. For those first few years, all the Stonewall leagues were operating independently. With the Stonewall expansion to other cities and the formation of Stonewall Dodgeball in 2014, a governance structure was put in place with a national board under the name Stonewall Sports. Stonewall Darts officially joined the organization and made changes to follow the new governance structure and expansion policy. In March, its members informed Stonewall Sports that they had decided to separate themselves and rebrand as Rogue Darts. 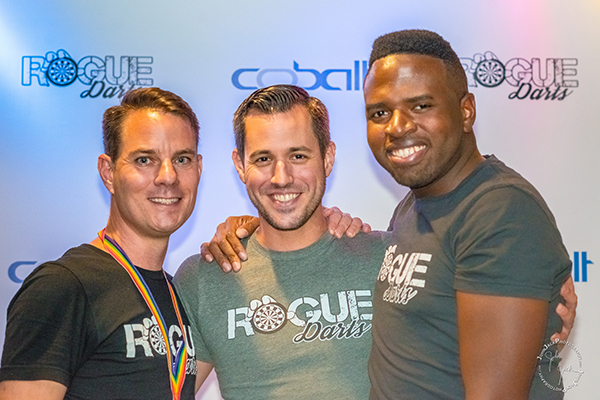 Rogue Darts rolled out this summer with 336 players on 56 teams playing on Thursday nights at Cobalt. Registration for the winter season opens on Dec. 4 for returning players and the following day for new players. Along with the summer and winter leagues under the Rogue Darts name, they continue to run the offshoot league, Tuesday Night Flights, at Nellie’s in the spring and fall. Both leagues utilize steel tip darts and the game of Cricket. At 336 players, they have increased the number of boards, walls and physical space to foster more growth. One thing that continues to be a struggle is coming up with 56 distinct colors for the team shirts. One of the unique things for Rogue is that sponsorship for the league is built-in since they are playing in bars. It opens them up to looking for sponsorship outside of the food and beverage industry such as the support they receive from the Tom Buerger Team. Registration for the league is $50 per player and Rogue Darts is currently giving $60 per player to charities chosen by the teams. This season, the dart leagues will surpass $150,000 in charitable giving to local nonprofits over the past five years. Rogue has added two new board members including a director of education to take them to the next level in engaging their charities. Coming up for Rogue Darts is continued branding efforts, enhancements to the player experience and a possible expansion to Northern Virginia. Henderson speaks to the draw of playing in a dart league.